When Kenzō Tange was asked to draw up a master plan for Lumbini in 1978, the famous Japanese architect’s vision was to develop the nativity site as a forested and tranquil place reflecting the Buddha’s teachings of compassion and frugality. 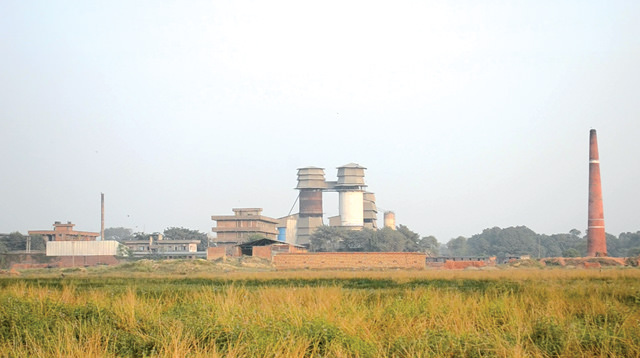 Although progress on the Lumbini Master Plan has been sluggish, successive governments over the last 40 years have largely followed Tange’s original blueprint for the World Heritage Site. But now, a proposal to build luxury hotels inside Lumbini’s core area threatens to mangle the master plan and disturb the sanctity of the Buddha's birthplace in Nepal. Three years ago, when Dipak Chandra Amatya, a confidante of UML leader Jhalnath Khanal, was Nepal’s Culture Minister, he set up a committee to review the master plan, which then directed the Lumbini Development Trust (LDT) to allow at least four deluxe hotels and one international meditation centre inside the protected zone. Tange, one of the most eminent architects of the 20th century, also designed the Hiroshima Peace Memorial Museum. But the LDT got an administrative staff, Iman Singh Muktan, to make alterations to Tange’s master plan. Now deputy mayor of Rapti municipality in Chitwan, Muktan admits his five-member committee did not consult anyone to approve the proposal to build more hotels within the Lumbini World Heritage site. New concrete structures are already coming up next to the crane sanctuary in the wetland inside Lumbini's protected zone. “We did not have enough time and resources to consult people, and we did not really mean what we wrote in it: the LDT should not have taken our proposal seriously,” Muktan now confesses. 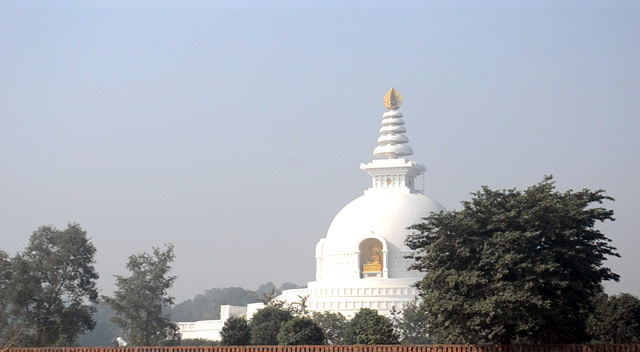 Nevertheless, the Lumbini Trust used Muktan’s recommendation to allow the construction of more hotels at the northern end of Tange’s design, adjacent to the Peace Stupa. Ajitman Tamang, who retired as the member secretary of the LDT this month, told Nepali Times he had also invited Thailand’s Dhammakaya temple to build a huge international meditation centre in Lumbini. 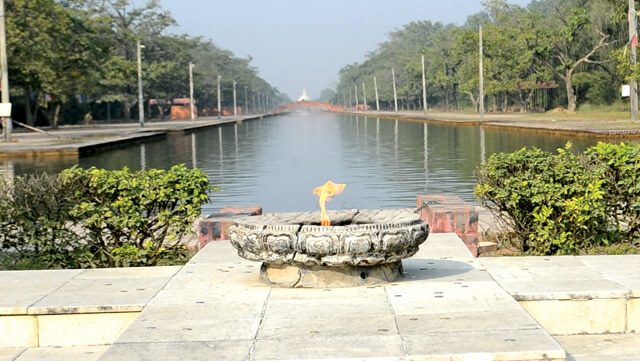 The view north from the eternal Peace Lamp up the Central Canal towards the Peace Stupa. Dhammakaya is one of the most powerful and controversial Buddhist sects in Thailand, and wants to build a guesthouse that can accommodate up to 1,000 pilgrims. Sources say UML leader Khanal’s son, who was implicated in a construction scandal at Bhairawa’s new international airport, and a Patan-based idol exporter are involved in the hotel project. Lumbini is now a rectangular green oasis in the middle of farms and factories along the densely-populated Bhairawa-Butwal industrial corridor. 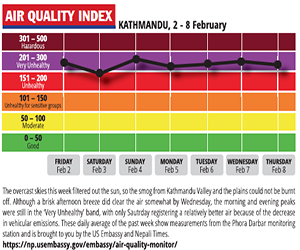 Pollution from the factories is already affecting the tranquility and pristine environment of Buddha's birthplace. So far, there are only three hotels (Kasai, Hokke and a pilgrimage centre) inside the Lumbini site, and lack of space in the Tange blueprint for more high-end hotels. So, the LDT is planning to make room by building over adjacent wetlands that are habitat for endangered Sarus cranes and other migratory birds. The Peace Stupa marks the northern edge of the axis of Kenzo Tange's Lumbini Master Plan. The stupa is adjacent to the crane sanctuary, where five new luxury hotels are proposed to be built. Although Lumbini does have a shortage of rooms for pilgrims, there are 20 hotels outside the protected area catering to all levels of tourists. But land is expensive and ownership fragmented, so investors cannot find suitable sites for big luxury hotels outside the nativity zone. Leasing land inside Lumbini would not only be cheaper but owners could also charge premium room rates from wealthy pilgrims. The under construction Lumbini Museum. The Mayadevi Temple at the Sacred Garden is the inner sanctum of Lumbini, where Buddhist pilgrims from all over the world congregate. Lumbini is not only the birthplace of the Buddha, but also home to the Sarus crane (Antigone antigone), the tallest flying bird in the world and an iconic species of wetlands. Legend has it that the Buddha once rescued a wounded crane and set the bird free in the jungles of Lumbini. The Buddha is seen in many historic drawings with a crane, and scholars believe that these non-migratory cranes have inhabited Lumbini for at least the last two millennia. 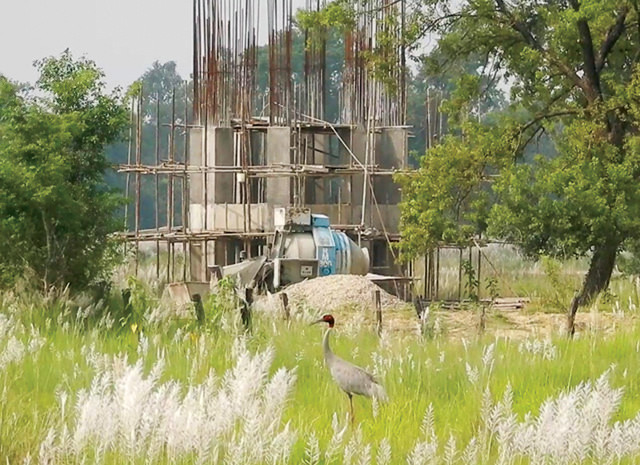 A 100-hectare bird sanctuary was set up in the New Lumbini Village along the northern perimeter of the Lumbini Master Plan by the International Crane Foundation, which had taken the land on a 50-year lease from the Lumbini Development Trust (LDT). The Foundation reserved the natural wetlands and built ponds inside the sanctuary so the cranes could mate, hatch and raise chicks during the monsoon. The protected habitat is now threatened by plans to allow new hotels on the wetlands and its surroundings. 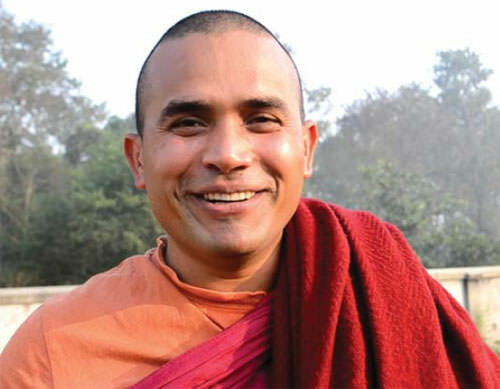 Metteya, whose official name is Awadesh Tripathi, was recently appointed Vice Chair of the LDT, and his first order of business will be to protect Lumbini’s holy birds. But Ajitman Tamang, former LDT member secretary supports the hotel plan, saying: "People come to Lumbini to pray, not to watch birds." 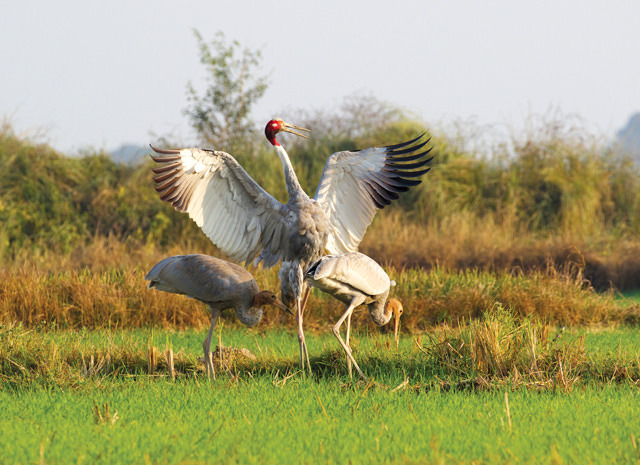 Nepali Times: Tell us about Sarus cranes, and the threats they face. Venerable Metteya: Sarus cranes are endangered mainly because of habitat loss. They nest in wetlands close to farms, but land is scarce and there is encroachment. The use of pesticides has poisoned the cranes’ food cycle. Their egg shells have become thinner, and the hatching rate is low. High-power transmission lines are another threat to the low-flying cranes. Is it possible for the hotels and the wetlands to co-exist? Kenzō Tange’s idea was to leave 60% of Lumbini as a nature preserve, and the crane sanctuary was a vital part of that plan. 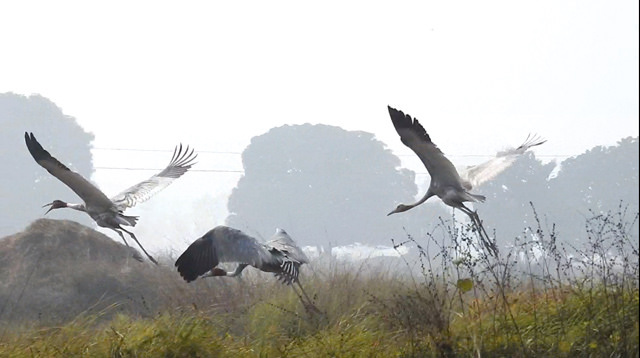 The preservation of Sarus cranes will enhance the cultural values and significance of Lumbini. Building hotels where the cranes live is not what we want to see in Lumbini. That is not the legacy we want to leave behind for future generations. The Buddha was born under a tree, got enlightenment under a tree, and passed away under a tree. His teachings reflect this harmony between humans and nature. Tange’s Lumbini Master Plan reflected that. Why is it important to save the Sarus crane? Farmers in Lumbini believe that if Sarus cranes alight in their farmls they will have a better harvest. 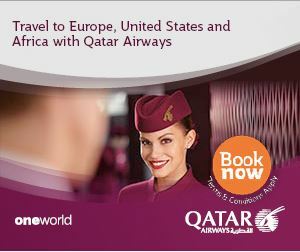 There is also scientific evidence that the cranes eat bugs and insects that destroy crops. The birds’ wetland habitat also helps recharge ground water by acting as natural sponges and filtering pollutants. They are a vital part of the ecosystem, and we must preserve them.